Tom Friedman is one of his generation’s best tinkerers. He is a minimalist, using common materials simply, and a maximalist, creating exuberant and improbable art works from Styrofoam, spaghetti, eraser shavings, garbage bags, toothpicks, bubble gum, dust, soap and yarn. He has carved a tiny self-portrait bust the size of an aspirin from soap; he has used a box of cooked spaghetti joined end-to-end to create a tangled ball of twine. Friedman applies painstaking processes to create surprising yet charming works that speak of the joys and frustrations of everyday life. 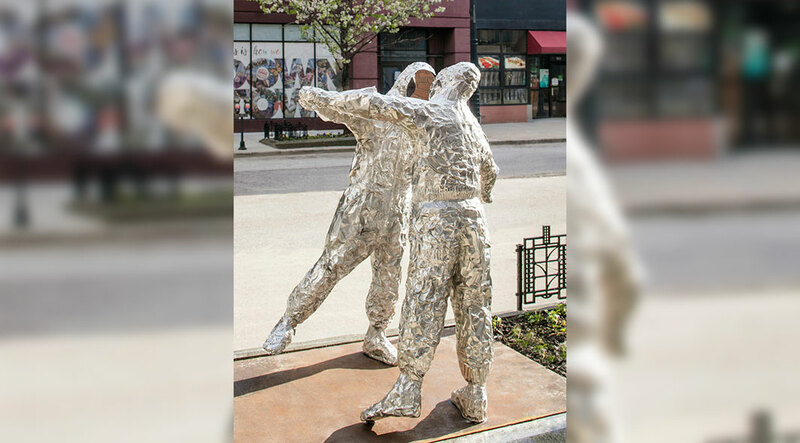 Since 2007, Friedman has been creating sculpture and sculptural environments made of aluminum foil, roasting pans and baking tins. The supple yet durable materials are easily shaped and keep their edges and finger-print divots when cast into the high gloss modern material of stainless steel. In Hazmat Love we see two men in protective gear wrestling—are they trying to save themselves, or each other? We can draw some contradictory meanings from this work. Hazmat suits are specialized gear designed to protect humans from our own disasters—in the environment, perhaps in the kitchen. In the labor-intensive work, the artist shows the paradoxes of the life we humans create. Friedman, born in St. Louis in 1965, lives and works in Massachusetts. He received his BFA in graphic design at Washington University, St. Louis, in 1988, and his MFA in sculpture at the University of Illinois at Chicago in 1990. One-person exhibitions have been held at the: Mead Museum, Amherst College, Massachusetts; the Tel Aviv Museum of Art, Israel; Magasin II Museum and Foundation for Contemporary Art, Stockholm; FRAC Montpellier, France; the St. Louis Art Museum; the Fabric Workshop and Museum, Philadelphia; the Fondazione Prada, Milan; the Museum of Contemporary Art, Chicago; the Aspen Art Museum, Colorado; and The New Museum, New York, among many others. His work has been included in group gallery and museum shows in China, France, Germany, Iceland, Ireland, Italy, Japan, Monaco, The Netherlands, Poland, Switzerland, the United Kingdom and the United States. His works has been presented outdoors in Austin, Chicago, Frisco, Texas and New York.